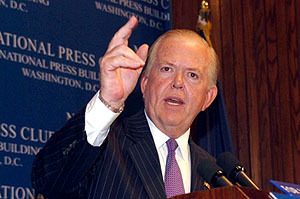 Lou Dobbs, the longtime CNN anchor whose anti-immigration views have made him a TV lightning rod, said Wednesday that he is leaving the cable news channel effective immediately. “Some leaders in the media, politics and business have been urging me to go beyond my role here at CNN and engage in constructive problem-solving,” Mr. Dobbs said just after 7 p.m., suggesting that he would remain involved in the civic discourse, but perhaps not on television. Hey, maybe he’s going to run for office! Wouldn’t that be fun? Maybe mayor of some border city to start. I’m thinking El Paso. Then, after Sarah Palin wins the presidency in 2012, she could appoint him to head up Homeland Security. From there, the sky’s the limit. For more on Dobbs, here is Sridhar Pappu’s profile from our January 2007 issue. Enjoy!